HALLE.- Martin Luther's original death mask belongs to the treasures and witnesses from the Reformation that Halle is amply equipped with. In one room of the tower, you can see the death mask of the great reformer, as well as a later plaster cast and a pulpit that stems from Luther's time. Presumably, the mask was created after a plaster cast that had been made by the local painter Lukas Furtenagel on Luther's deathbed in Eisleben on February 19, 1546. As Luther's body had to be taken to Wittenberg for the planned burial, his coffin was placed in the vestry of Halle's Market Church for one night, from February 20 to February 21, 1546. It was due to the Protestant minister Justus Jonas, who was a close friend of Martin Luther and preacher at Halle's church Marktkirche, that the church's parish came into the possession of Luther's death mask. The plastic cast of Luther's death mask testifies of the chequered history of the mask, proving people's admiration or Luther and his work in the course of the centuries. 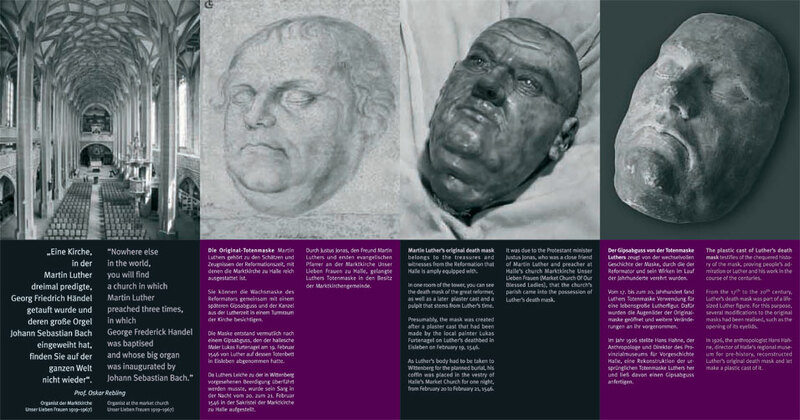 From the 17th ti the 20th century, Luther's death mask was part of a life-sized Luther figure. For this purpose, several modifications to the original masks had been realised, such as the opening of its eyelids. In 1926, the anthropologist Hans Hahne, director of Halle's regional museum for pre-history, reconstructed Luther's original death mask and let make a plastic cast of it. The Pulpit from Luther's time is a high-ranking piece of the Middle-German Renaissance art of carving. Its small basket stems from the Marktkirche (Market Church). According the records, Luther used to preach from thie pulpit, for the present pulpit was only set up around 1547. Luther held three sermons in Halle's church Marktkirche (Market Church): on August 5, 1545, as well as on January 6 and January 26, 1546.